Fox News is mostly an American problem, but South African readers will probably have heard of Bill O’Reilly, the conservative political pundit who spends a lot of time being angry about Obama, people who don’t believe in God, and various other issues. Chris Stedman (here’s my review of his book, Faitheist) has written an interesting post on how the “war on Christmas” is actually a war on atheist voices. The title of the post sets up a false dichotomy, in that it could be both, but the post makes various good points. 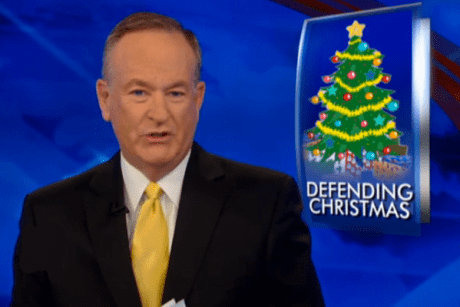 O’Reilly exploits every possible opportunity for hyperbole, and Christmas is no exception. The “war on Christmas” is pretty much an O’Reilly invention, and refers to the (alleged) efforts of non-religious folk to keep the Christ out of Christmas. But as I remarked to a journalist who recently interviewed me on how South African atheists feel about Christmas, Christmas is to all intents and purposes a secular holiday for most folk already. By this I don’t mean that Christians have forgotten about Jesus – just that the bulk of proceedings are a rare and (sometimes) pleasurable opportunity for friends and family to gather. The Christ-related bits will involve a prayer of thanks, and maybe some reading from the Bible, but my point is that the day is not going to involve excessive religious ceremony, even for Christians. Christ will no doubt be in their thoughts at times, but I will celebrate Christmas just like they do, for the most part. In this context, there’s nothing to go to war over. If I’m right, and Christmas is secular in any case, Christmas provides an opportunity for two things (not an exclusive list): one, celebrating Christmas and two, being obnoxious towards Christians, and conforming to a certain stereotype of how offensive atheists are. I choose the first option. And as Stedman points out, most atheists do also, which is why his piece argues that it’s a war on atheism through mischaracterising us, rather than on Christmas (as I said at the top, it could be a war on both, so I think the title poorly chosen). He links to interesting research that suggests only 15% of atheists in the USA are anti-theist, meaning that they “believe that the obvious fallacies in religion and belief should be aggressively addressed in some form or another”. The remainder are characterised as academic atheists, agnostic atheists etc., but regardless of whether you disagree with how the authors carve the landscape up, it’s true to say that some atheists are more aggressive than others – and it’s fair to ask whether they should be taken as representative of the whole. As with all contested topics – or even “all topics” – those who make the most noise, or who say the most outrageous things, will get the attention. In the USA, it’s American Atheists, who use Christmas as an annual opportunity for provoking the religious. American Atheists say that their approach works, and I’m pleased that Massimo Pigliucci has written this post arguing that it doesn’t, because that’s my sense of things too. The rest of us need to perhaps make more noise. I don’t know – I certainly feel like I make enough of it, but perhaps not in some of the places I should – for example, I’ve left all the Facebook atheist communities I used to belong to, because they were filled with too many obnoxious people. That’s a problem to resolve another day, though. For now, and until the end of the Newlands cricket test on (theoretically) January 6, I’ll probably be quite quiet here, though still active on Twitter. If you’re celebrating Christmas as a Christian, joy and peace and all that to you. If you’re doing what I’m doing, which is eating and drinking too much with great friends, have a wonderful day also.